Enjoy sweet treats & opportunities to donate to support the kids of St. Jude. 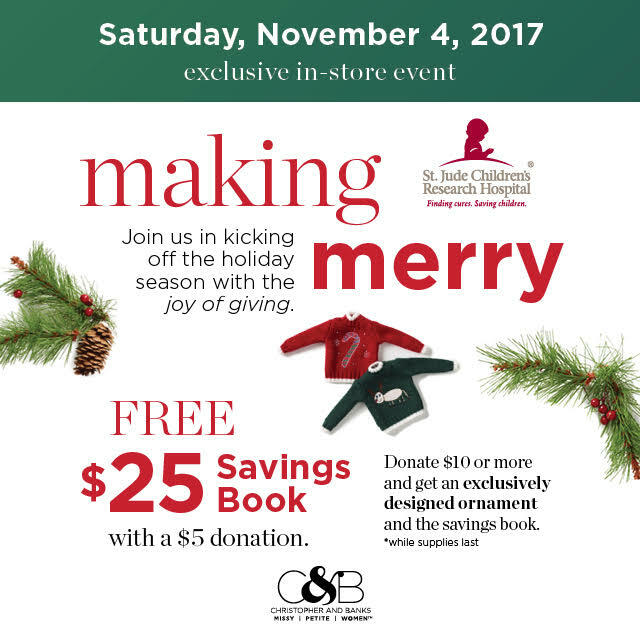 Join us on Saturday, November 4, in kicking off the holiday season with a giving event at Christopher and Banks. This season, we’re giving the gift of thanks to the kids of St. Jude Children’s Research Hospitals, where no family ever receives a bill for treatment, travel, housing or food. Donate $5 and get a $25 savings book. Donate $10 and receive a one-of-a-kind exclusively designed ornament and the savings book! There will be sweet treats provided by Shotwell Caramels and opportunities for you to donate and make merry to support the kids of St. Jude.